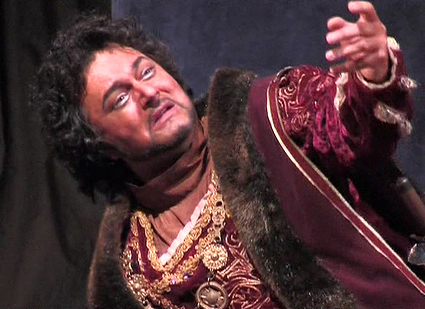 European Tenor Martin Iliev stars in the title role of Verdi’s Otello. Mr. Bakardiev no doubt agrees with Maestro Toscanini and, as such, undertook an exhaustive casting search for the title role. “It’s very rare to find the voice, the power, the looks, and the dramatic ability put together in a single artist,” he recently stated. However, tenor Martin Iliev fits the bill as Otello on all counts. 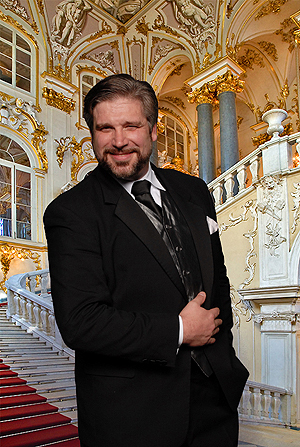 Since his Wichita debut – as Cavaradossi in WGO’s celebrated 2006 Tosca starring Samuel Ramey and Annalisa Raspagliosi – Mr. Iliev has earned high praise across Europe performing the most demanding tenor roles by Verdi, Puccini, and Wagner. His voice has even been compared to the great Ramón Vinay, who is still widely considered one of the greatest Otellos ever. To get the action moving, Verdi dispenses with Shakespeare’s first act and begins as Otello, a Moorish general, arrives in Cyprus to take command of Venetian forces fighting against the invading Turks. After Otello’s triumphant arrival – accompanied by his wife Desdemona, his ensign Iago, and his newly-promoted Captain, Cassio – Iago’s simmering resentment and jealousy spin an intricate web of deception leading to one of the greatest tragedies in opera. The world’s premiere Desdemona, Zvetelina Vassileva, returns to the WGO stage in her signature role. Reviews of her performances – from London, to Madrid, to San Francisco – call her singing “magnificent”, “breathtaking”, “perfect”, and dozens of similar terms. Verdi had officially retired after he completed Aida in 1871, secure in his position as the most popular (and wealthiest) composer Italy had ever known. Giulio Ricordi, the leading music publisher in Italy at the time, thought this turn of events was a terrible waste of talent and potential profits. 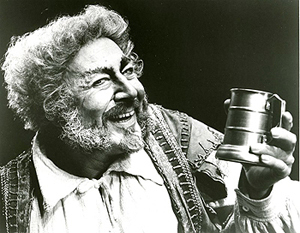 Knowing Verdi’s fascination with Shakespeare’s plays, Ricordi began a long and subtle campaign to coax Verdi out of retirement. Sixteen years later, Otello finally made its way to the stage. Despite his track record, Verdi was extremely nervous about Otello, demanding that rehearsals take place in complete secrecy and that he would be allowed to call off the entire production at any time. His worries were unfounded – a reviewer present at the premiere claimed that Otello was on a “higher musical plane than any which [Verdi] has hitherto reached.” The audience agreed, demanding twenty curtain calls for Verdi, after which a cheering mob accompanied the composer back to his hotel. Metropolitan Opera Bass William Powers stars in the title role of Donizetti’s Don Pasquale, Feb. 8th, 9th and May 17th. the historic Stiefel & Orpheum Theatres and the McPherson Opera House. By popular demand, the WGO reprises its hilarious Don Pasqualewith the addition of William Powers in the title role, a veteran of the Metropolitan Opera and virtually every other major opera house in the world. Mr. Powers will revisit the role that started his long and successful career, which now covers more than 100 roles. In this sparkling comedy, composed in an eleven-day burst of inspiration, the elderly bachelor Pasquale forbids his nephew Ernesto, who sings in the Don’s restaurant, to marry the penniless Norina. When Ernesto refuses to marry the girl Pasquale has chosen for him, he decides to take a bride himself and disinherit Ernesto. Doctor Malatesta, Pasquale’s physician, decides to aid the young couple, arranging a fake marriage between Pasquale and his sister “Sophronia” (Norina in disguise). As soon as the sham wedding is complete, Norina turns cold and calculating, transforming his quiet little restaurant into a hopping nightclub. Desperate to be rid of his bride, Pasquale hits on a plan: “Sophronia” refuses to live in the same house with another woman, so Pasquale agrees to allow Ernesto to marry Norina on the spot. When Norina’s disguise is revealed, The Don realizes marriage is best left to the youngsters. Joining Mr. 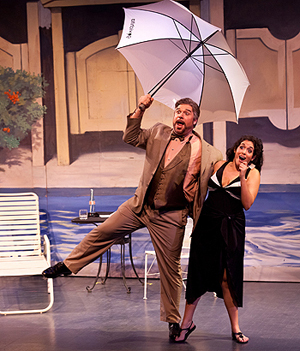 Powers for this brilliant comedy is Sharin Apostolou, called “electrifying” by critics, making her WGO debut as Norina, and WGO alum Dustin Peterson makes his debut in the role of Pasquale’s nephew, Ernesto. Maestro Ken Hakoda takes the baton for Pasquale, making his WGO debut. This will be Wichita Grand Opera’s first fully-staged productiomn in Salina’s Stiefel Theatre, the McPherson Opera House, and Wichita’s own Orpheum Theatre. All three are beautiful theaters, offering excellent acoustics and an intimate size comparable to the charming and ornate opera houses of Europe – a perfect settings for this comedic production! 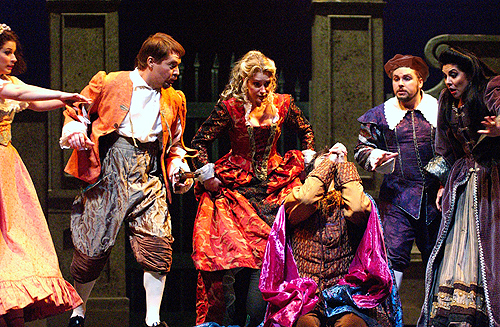 Mozart’s The Marriage of Figaro is widely known as the greatest comic opera ever composed. In more than 225 years since its Vienna premiere, it has remained solidly in the top five most-performed operas in the world. When Tchaikovsky first heard Figaro in Paris, he promptly informed a close friend, “I have just returned from the Opéra-Comique, where I have heard The Marriage of Figaro twice, and if any more performances are scheduled, I will carry on going to them. My God! How divinely beautiful this music is!” Renowned American singer/director John Stephens returns to stage Wichita Grand Opera’s debut production of The Marriage of Figaro. WGO’s 2012 Singer of the Year Michael Nansel stars as the Count in Mozart’s The Marriage of Figaro. The storyline picks up a few years after the action of The Barber of Seville. The Count Almaviva has married his beloved Rosina, and has hired the former barber Figaro as his personal head of staff. However, the Count has grown restless and spends his days attempting to seduce Figaro’s bride-to-be Susanna. To get even, Figaro, Susanna, and the Countess Almaviva come up with an elaborate plot that involves disguises, hiding in wardrobes, and men jumping out of windows to escape detection! Finally, the Count is caught red-handed seducing his own wife and begs for everyone’s forgiveness. WGO’s favorite baritone, Michael Nansel, stars as the skirt-chasing Count, and Metropolitan Opera soprano Zvetelina Vassileva stars as the Countess. Veteran of more than 275 performances on the Met Opera stage, baritone Patrick Carfizzi makes his WGO debut in the title role, a role that has garnered him critical acclaim. 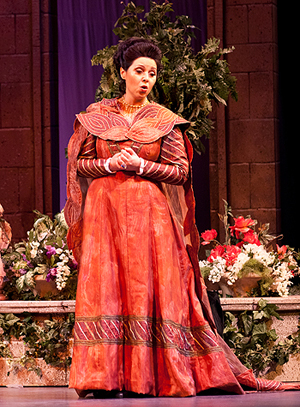 Soprano Ava Pine, called “a goddess!” by Fort Worth Opera Director Darren Woods, makes her WGO debut as Susanna. WGO’s favorite baritone Michael Nansel stars as the skirt-chasing Count, and Metropolitan Opera soprano Zvetelina Vassileva stars as the Countess. Wichita native and Met Opera tenor Brian Frutigar stars in the role of Basilio in his WGO debut. Internationally renowned Maestro Steven Mercurio, known to audiences from the Three Tenors, Andrea Bocelli and now pop-crossover sensation Il Volo, returns to Wichita to lead the WGO Cast, chorus, and orchestra. Considering that the French Revolution would begin just three years after Figaro’s premiere, its subject matter – two servants getting the better of their aristocratic master – might not have gone over well with censors in much of Europe. Fortunately for Mozart, Emperor Joseph II was a very progressive ruler for his time, and the premiere was so well received that the Emperor eventually had to ban encores of certain pieces to keep performances from running too long. 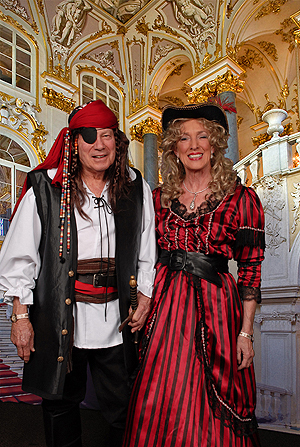 WGO’s 2011-2012 Chairman of the Board, Bill Oliver, and his wife, Mary Lynn, in costume at the Chairman’s Opera Ball this past season. A Prague production several months later was so popular that the Prague orchestra and local music lovers paid for Mozart to come see the production. When Mozart arrived, the theater’s impresario promptly commissioned him to write another opera – Don Giovanni. WGO’s annual Chairman’s Opera Ball returns to the charming Crown Uptown Theater after the hugely successful 2012 “Masquerade” Ball. A staple in Wichita and for the Wichita Grand Opera season, the Chairman’s Opera Ball is a magical event not to miss. WGO’s Opera Ball planning committee is hard at work developing an exciting new theme for the 2013 Ball. Tickets for the Chairman’s Opera Ball are not included as part of WGO’s season packages, but individual tickets are $200 each and tables run from $700 to $1,500, a portion of which is tax-deductible. Ekaterina Egorova stars as Odette and Aydos Zakan stars as Prince Siegfried in Tchaikovsky’s Swan Lake on May 1st. The Russian National Ballet Theatre, directed by Bolshoi ballet star Elena Radchenko, returns to Wichita for the first time since 2009’s Cinderella. This time the company of more than 50 outstanding dancers will perform Tchaikovsky’s masterpiece Swan Lake, in which Odette, a princess turned into a swan by an evil sorcerer’s curse, can only be freed from the spell by true love. Ekaterina Egorova dances the dual roles of Odette and Odile, the White and Black Swans, opposite Aydos Zakan as Prince Siegfried. One of the most popular ballets of all time, Swan Lake has inspired countless adaptations, including the 2010 Academy-Award-winning film, Black Swan. WGO stars, Resident & Young Artists and chorus take the stage for Opera on the Lake. The grand finale of Wichita Grand Opera’s regular season takes place May 18thunder the stars at Bradley Fair. 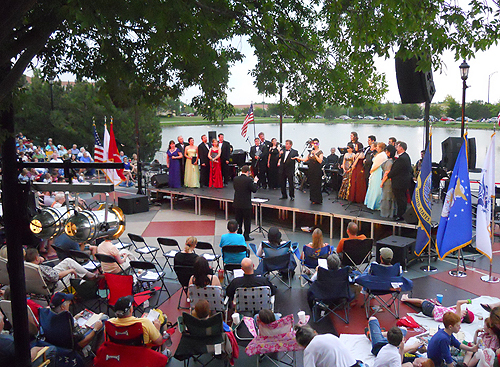 A Wichita summer tradition, Opera on the Lakefeatures WGO stars, Resident Artists, Young Artists, and ensemble singers. Opera on the Lake at Bradley Fair is WGO’s gift to the community and is free to the public. Or choose to be a VIP that evening with an elegant three course dinner, served with panache by the expert staff of Newport Grill. Tickets to the VIP dinner are not included as part of WGO’s season subscriptions with limited seating available. And get your favorite seats! Regular Priced single tickets for the 2012-2013 season will go on sale December 3, so don’t miss out on the savings. Tables must be purchased with a single payment. 316.262.8054 or go online at www.selectaseat.com. are sold through their Box Offices only.